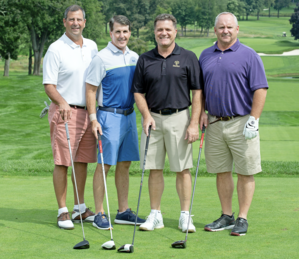 DARIEN, CT – Nearly $160,000 was raised by 110 area business professionals during The Maritime Aquarium at Norwalk’s 8th annual Maritime Golf & Tennis Classic on Sept. 17 at Wee Burn Country Club. The tournament supports the Aquarium’s exploration of animal and conservation issues in Long Island Sound while also helping to provide STEM-focused educational opportunities to area students, regardless of their ability to pay. Among the foursomes were Marty Devaney of Southport, Michael Diamond of Fairfield and Scott Gerard of Fairfield. An accredited member of the Association of Zoos & Aquariums, The Maritime Aquarium at Norwalk is a 501(c)(3) not-for-profit institution whose mission is to inspire people of all ages to appreciate and protect the Long Island Sound ecosystem and the global environment through living exhibits, marine science and environmental education. The Maritime Aquarium receives support from the State of Connecticut DECD’s Offices of Culture and Tourism.